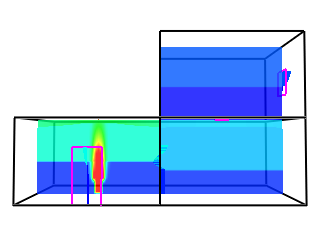 CFAST is a two-zone fire model capable of predicting the environment in a multi-compartment structure subjected to a fire. It calculates the time-evolving distribution of smoke and gaseous combustion products as well as the temperature throughout a building during a user-prescribed fire. CFAST is free and open-source software provided by the National Institute of Standards and Technology (NIST) of the United States Department of Commerce. Pursuant to Title 17, Section 105 of the United States Code, this software is not subject to copyright protection and is in the public domain. View the full disclaimer for NIST-developed software.